Growing up, my family sponsored a child through a large, well-known organization (it rhymes with Shmerld Crision…) and Ariga’s picture sat on our fridge for years. Even as he refused to age, stopped graduating and his letters came less often, his picture and occasional letters were constant reminders to me about those in need a world away. Our family sponsored Ariga, at about $30 a month, for about 8 years. Now before I get into some fundraising nerdery and discuss things like Lifetime Value (my family’s was $2,880 by the way) I want to pause and talk about something else: lifetime values. Fundraising and the act of giving itself is transformative. For both the giver and the receiver. My parents instilled the principle of giving and caring for others in me from a young age. It played a major role in shaping who I am and what I believe. I ended up studying business with an eye on finance and international development before getting into fundraising – still in international development – and then technology, agency and consulting – still all around fundraising and charitable work. The key point here: the impact that an organization, giving and fundraising has on the lives of people is impossible to quantify at some level and more powerful than we can even imagine. Personal pause over. Fundraising nerdery starting. Child sponsorship programs, a ‘tangible’ monthly giving program, are one of the best examples of a Lifetime Value (LTV) strategy. LTV is the average annual contribution of a donor multiplied by the average number of years they contribute. 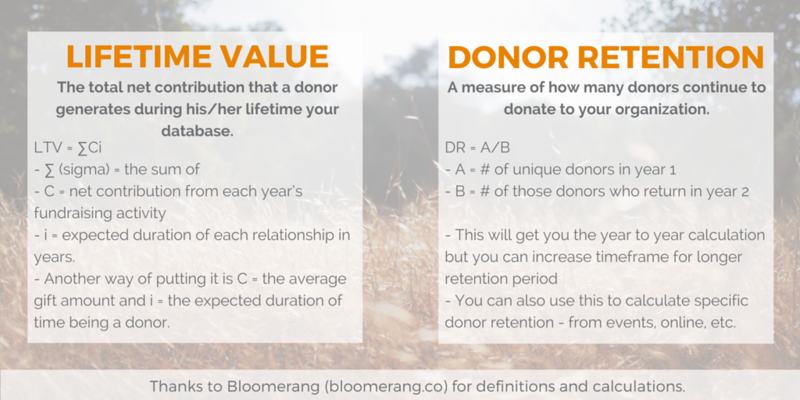 Here’s a simple breakdown of LTV and (donor retention). I made a spreadsheet with LTV and donor retention calculations and you can see it, copy it, use it here. There are some much more complex ways to get at LTV (KISS Metrics has a cool inforgraphic here – not fundraising specific though) but it’s a single number that calculates a donor’s financial value to your organization over their lifetime. It’s also, in my opinion, the single most important metric to track, measure and strategize around for fundraising organizations. That $50,000 came from 300 people. 150 of those people were new and gave again to the organization (average $150 per year for 3 years) and 50 of them committed to giving $25/month – $300 per year and gave for an average of 3.5 years. Using some simple math and the LTV equation, the event raised $50,000 on the night and was responsible for another $120,000 in the next 3.5 years. So the LTV of the event looks a bit more like $170,000 from $50,000 spent. That’s $120,000 net and 29% efficiency (it took $0.29 to raise $1.00). That’s a pretty different story. Now there was some extra work needed to keep those donors in the months and years after and it’s not like there were zero costs and resources required to do that. But at the same time, we are not calculating volunteer hours contributed, friends recruited and their giving or any legacy or major giving that may come from that cohort of event donors either. Let alone any of that soft, “lifetime values” stuff. The point, today, isn’t to get into the nitty gritty and complexity of LTV tracking but to take a step back, think more holistically about your fundraising and longer-term with your evaluations. That’s why I love LTV. 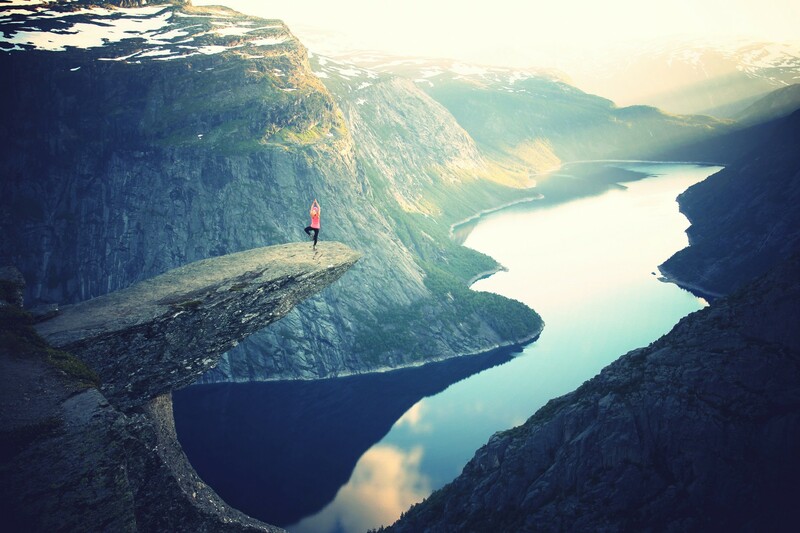 It forces you, your organization and your team to think differently. And it can start by measuring differently. When you do, then things like donor retention become more important as there are really only two ways to increase LTV: get people to give more or get people to give longer. In both cases,the key driver behind getting people to give more and give longer is donor satisfaction! LTV is just the right measuring stick to help your organization think about and focus on what your donors want and how you can best communicate with them. If you are lucky enough to build relationships with people where they stick around for 8 years and put reminders of your work on their fridge, not only will Lifetime Value be high and your organization better funded but there will be some lifetime values changed as well.